I’ve used a 4.25″ x 5.5″ card base in Chocolate Chip. Next comes some distressed and inked designer paper followed by a lacy oval nestie, topped with more distressed designer paper. The horizontal piece is made with some designer paper, Verve’s Pennant Trim die and some crochet lace. The sentiment is on a die cut. It’s been made with designer paper that’s been stamped with a flower image and then stamped with the sentiment. 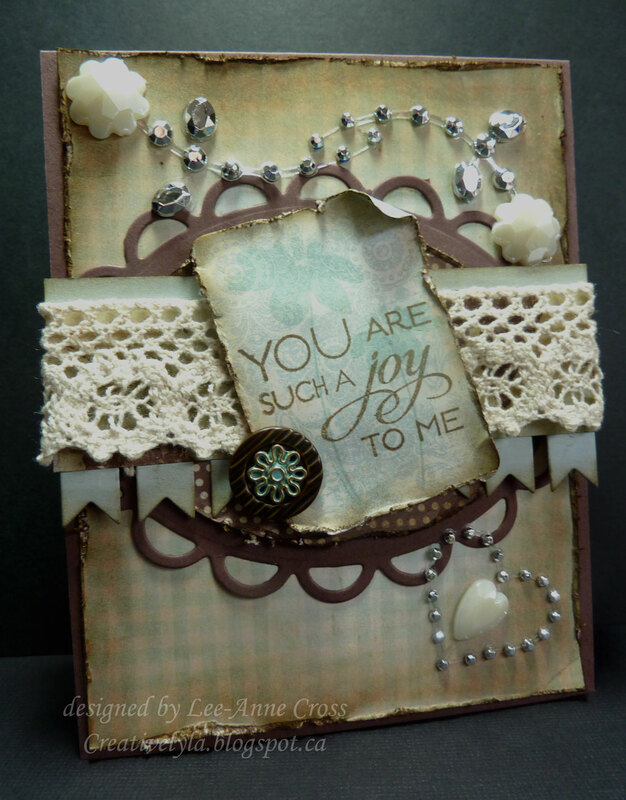 Lots of bling…some from Tim Holtz and some from K & Co.
Paper: SU! Chocolate Chip, MME Paris & Co. Thanks for joining me today my friends! Back soon with more! Love the rustic feel to this! Such a lovely card.